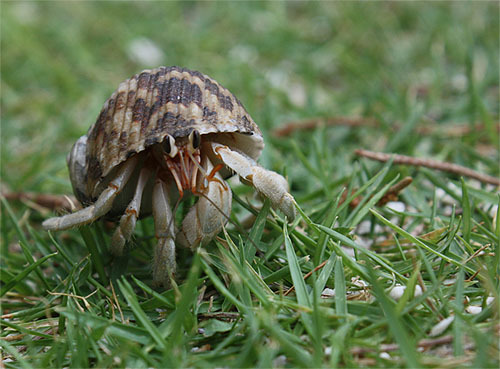 "Oh look, a hermit crab!" That is probably the worst sentence that I can imagine being spoken, in any language. Because every time I hear it, I get picked up by a grubby handed kid, or some insensitive moron adult, and then passed around like some kind of freaking toy while everyone is like "How cute!" or "That's so cool!" or my personal favorite, "I wish I could carry MY home around!" Actually, you don't wish that. That's just a dumb thing you thought up to sound all witty and ironic. Just stop. Truth be told, I carry my home on my back because it's the only way I can avoid being eaten. This shell is really heavy, and in case you haven't noticed, I am very small, so yeah, it's not fun lugging this thing around all the time. Think of it this way: Imagine you're carrying around a piano and someone comes up and starts tickling you. That's what it is like when you see me on the beach and pick me up. However, I am glad you think I'm "cool". You know what I think is cool? Jellyfish. As in, annoying tourists accidentally walking on them and getting their toes stung. That always makes me laugh. I think of it as karmic payback. Now if you'll kindly get out of my way, I've got some business to attend to. Oh, and one more thing: You are lucky my claws are not large enough to pinch, because if they were, you would be howling with pain right now.